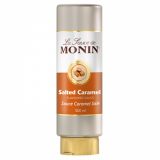 Morin salted caramel syrup in a stylish 70cl glass bottle. 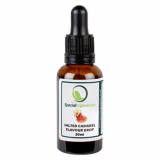 Caramel simply means caramelised sugar, traditionally obtained by melting sugar in a sauce pot of water. Add to that the sharp taste of salt and you have a sensational flavour! 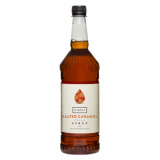 Salted caramel flavour is used in speciality coffee beverages, cocktails, desserts, and culinary applications. Colour: Shiny amber colour with copper yellow glints. Tasting Notes: Intense caramel nose with round notes of caramel candy. Salty notes enhance the rich and creamy taste of caramel and give a longer after-taste. Applications: Coffees, dessert drinks, after dinner drinks. 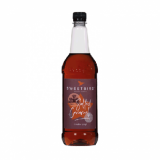 Pure cane sugar, water, natural flavours, salt.